The co-directors of Marvel's Avengers: Infinity War - brothers, Joe and Anthony Russo - chatted recently about the superhero saga, and let slip an interesting fact. 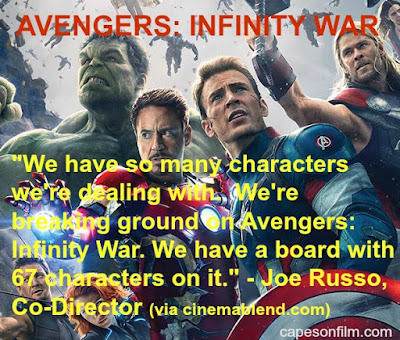 At one point in the interview, Joe Russo revealed Infinity War might have a massive number of Marvel characters - sixty-seven to be exact. Of course, Avengers: Infinity War Part One doesn't open until 2018, with Part Two following in 2019, so a lot can change between now and then. Still, it's fun to think about all those characters on the big screen. Paste has the full story below.